Are you a DVA Gold Card holder? Did you know the Department of Veterans' Affairs will pay your annual MedicAlert membership fee as well as the full cost of a stainless steel medical ID. Call 1800 822 222, provide your DVA Gold Card number and MedicAlert will take care of the rest. The Soldier On team in South Australia will be hosting an important seminar on Moral injury in the lives of Australian Military Veterans at 6pm – 7:30pm on 4th November 2015. This free seminar will provide guests with information on moral injury within the Australian military, followed with an anonymous invitation to be the first in Australia to contribute to establishing an empirical benchmark in this area. 'You and Your Pension' is a guide provided to income support pensioners including service pensioners, social security age pensioners (paid by DVA), and war widows and widowers who receive the income support supplement. The guide contains information about your benefits, rights and obligations. As well as being available in an electronic version, 'You and Your Pension' is produced as a booklet and an audio version is available on Compact Disc. The internet version of 'You and Your Pension' was reviewed for 20 September 2015. Other minor updates occur at various intervals throughout the year. Over time this may mean the internet version and the printed edition of 'You and Your Pension' may differ. NB: Always check the Factsheets for recent information or changes that are yet to be included in 'You and Your Pension'. 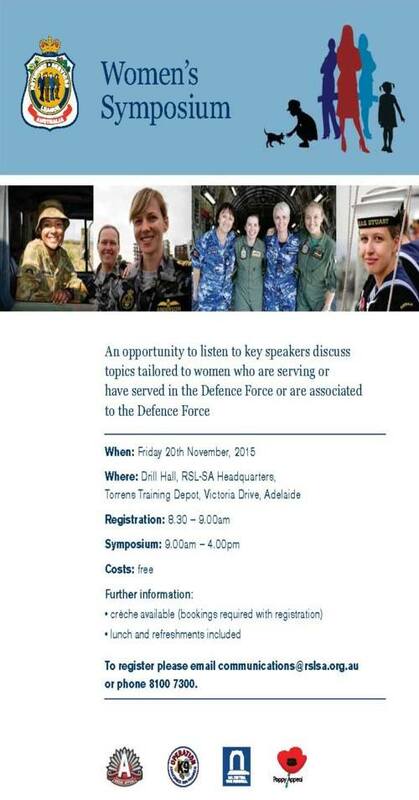 Key speakers discuss topics tailored to women who are serving, have served in Defence, partners or are associated with Defence. 9am – 4pm Torrens Parade Ground, Adelaide, Friday 20th November. Free legal advice and minor assistance is available from the Legal Services Commission of South Australia through its telephone advice line and face-to-face appointments. No older person should be subjected to any form of abuse, often referred to as ‘Elder abuse’. Elder abuse can take various forms such as physical, psychological or emotional, sexual or financial abuse. It can also be the result of intentional or unintentional neglect. Elder abuse can be defined as “a single, or repeated act, or lack of appropriate action, occurring within any relationship where there is an expectation of trust which causes harm or distress to an older person” (World Health Organization). If you are concerned about elder abuse you may want information about the issue, or the opportunity to talk to someone independently about your concerns and the options for getting help.